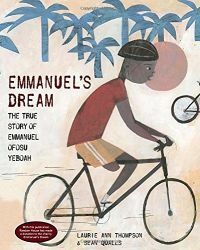 This picture book tells the true story of Emmanuel Ofosu Yeboah, a young man born with a deformed leg in rural Ghana who would later bicycle across his country, raising awareness for disabled people throughout Africa and around the world. This is the true story of Emmanuel Yeboah. Born in Ghana in 1977 with a deformed leg, he became the personification of courage, strength—mental and physical—and determination even as a child. His life and challenges are well-known in Ghana. This excellent picture book brings the narrative of his life to a wider audience, showing the power of the human spirit, even at a very young age! He is a true hero for kids. This story is, however, as much a story of a strong mother as of a son; indeed, we can say that Emmanuel’s strength must have flowed from Mummy Comfort, a mother who had faith, and refused to accept that her son’s misshapened leg was going to be an impediment. Without her comforting presence from the moment he was born, Emmanuel may not have grown up with such dedication and confidence in himself. In a cultural environment where any disability can easily mark one for life, Emmanuel, with his mother’s help, resolves to push on even as the conventional wisdom suggested that a boy who was not quite physically whole was bound to struggle. Emmanuel kicked against conventional wisdom and persevered. With Mummy Comfort’s encouragement ringing in his ears, Emmanuel goes to school, plays with his friends, and engages in opportunities to earn money. He does everything his friends and other school kids do: playing soccer, riding a bike, shining shoes! Indeed, Emmanuel’s ability to really learn to ride a bike, clearly an achievement given his physical deformity, was to determine his future. As Mummy Comfort falls ill, Emmanuel feels a duty to work and help support his family; his father had left the moment he was born because he could not face his son’s deformity. Emmanuel goes to the large city, and for two years endures hardship and ridicule to earn some money, only returning home when his mother takes a turn for the worst. A dying Mummy Comfort’s admonishment to never give up lights a fire in Emmanuel, who resolves to educate his nation on the fact that being “…disabled did not mean unable”. Indeed, being disabled should not be an impediment to one’s dreams. The one-footed young man undertakes a country-wide bike ride in an effort to demonstrate that in spite of his disability, he could endure life’s challenges as well as anybody. That is when Emmanuel becomes the embodiment of courage, strength and determination. He becomes a national hero, a role model, and a success. Emmanuel’s story is accompanied by Sean Qualls’ bold, beautiful, robust renditions of Emmanuel and his folk. In the author’s note we learn that Emmanuel’s political activism prompted the Ghanaian Parliament to pass the Persons with Disability Act that entitles people with disabilities to the same rights as other citizens in Ghana. Students can learn about Emmanuel’s nonprofit on his website EmmanuelsDream.org. The documentary about his life is entitled Emmanuel’s Gift. Emmanuel’s Dream is highly recommended. What a story!